Monticello Gaming and Raceway is a harness racing track, and home to a relatively new racino, in Monticello, Sullivan County, New York. It is off Exit 104 of Route 17 (future Interstate 86), on New York State Route 17B. The racetrack is nicknamed "The Mighty M" and races standardbred horse races during the afternoons year round. The current racetrack is an 1/2 mile oval. The track opened on June 27, 1958. Attempts since 2000 to add a full fledged Indian gaming casino via the St. Regis Mohawk tribe at the track has met with peril. Atlantic City, New Jersey casino operators including Donald Trump fought the proposal. Trump would be fined for not disclosing their lobbying efforts. In January 2008 the Interior Secretary vetoed any Mohawk plans for a casino saying the Mohawk reservation on the Canadian border was too far from the track. 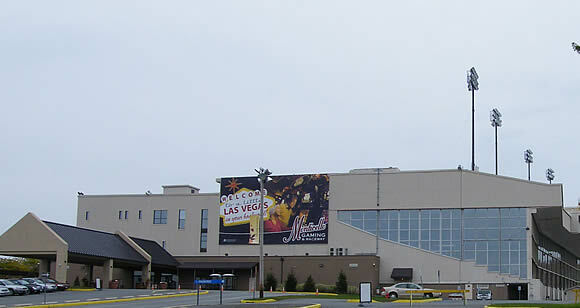 The casino at the raceway operates under a state license permitting slot machines at designated race tracks. In February 2008, Empire Resorts announced that the complex would relocate to the site of the Concord Resort Hotel, where a new 5/8 mile (1 km) race track, gaming area and various other amenities would be built. The new complex is scheduled to open in 2010.